Decision-makers do not have an easy job. Several factors (criteria) are relevant for different types of decisions, including clinical recommendations, health systems or public health decisions, and coverage decisions. Decision-makers need to consider the available research evidence and make judgments about each one of these factors. Some of the dangers of this process are that relevant factors are omitted, undue weight may be given to some, or the best available evidence may not always be included. Up to now there has been little help to do this in a systematic and transparent manner. Guidelines in particular should be rigorously developed and based on reliable summaries of the best available research. However, if guidelines are not developed transparently, clinicians or other potential users (e.g., patients or the public) are not able to assess to what extent they agree with the evidence. The GRADE (Grading of Recommendations Assessment, Development, and Evaluation) Working Group has recently published the evolution of its Evidence to Decision (EtD) table, which Philipp Dahm introduced in last month’s GROWTH commentary. Through the DECIDE (Developing and Evaluating Communication Strategies to Support Informed Decisions and Practice Based on Evidence) project1, GRADE has developed the Evidence to Decision frameworks2. These EtD frameworks have been developed for making clinical recommendations3, coverage decisions, and health system or public health recommendations and decisions. The frameworks build on the GRADE approach to assessing the strength of recommendations. GRADE has published an introduction to the frameworks2, the framework for clinical recommendations3, and the framework for decisions about diagnostic and screening tests4. There are two more frameworks: one for coverage decisions and the other is for health systems and public health decisions. Both of these are in the pipeline and will likely be published in 2016-17. The developed frameworks are based on the GRADE Working Group’s approach for moving from evidence to clinical recommendations5-7. The methodology used was iterative, including review of the research literature, brainstorming, stakeholder feedback, application to recommendations examples, and user testing1. Although the frameworks are similar, there are some differences among them. The main purpose of the EtD frameworks is to help groups of guideline panelists use evidence in a structured and transparent way to inform decisions in the context of clinical recommendations, coverage decisions, and health system or public health recommendations and decisions. The EtD frameworks have three sections: the formulation of the question, making an assessment of the research evidence (and additional considerations) supporting each criterion, and drawing conclusions1. Typically, technical teams prepare the EtD frameworks with the help of free, web-based software solutions like GRADEPro Guideline Development Tool (GRADEPro GDT)8, the interactive EtD9 (iEtD), and the interactive Summary of Findings (iSoF). These solutions can be helpful when using the frameworks in preparation for panel meetings or during these meetings. The iEtD and iSoF are also integrated in other alternative authoring and publication tools like MAGIC. These tools also support the development of tailored presentations for target audiences like clinicians, patients and the public, or policy makers. The EtD frameworks provide a structured and explicit approach to facilitate those making recommendations or decisions. For users of recommendations and those affected by decisions, EtD frameworks can enable them to assess the basis for recommendations or decisions, and help with the adaptation of recommendations or decisions to their specific contexts and settings. Treweek S, Oxman AD, Alderson P, Bossuyt P, Brozek J, et al. Developing and Evaluating Communication Strategies to Support Informed Decisions and Practice Based on Evidence (DECIDE): Protocol and preliminary results. Implementation Sci 2013, 8:6 doi:10.1186/1748-5908-8-6. Alonso-Coello P, Schunemann HJ, Moberg J, Brignardello-Petersen R, Akl EA, Davoli M, et al. GRADE Evidence to Decision (EtD) frameworks: a systematic and transparent approach to making well informed healthcare choices. 1: Introduction. BMJ. 2016;353:i2016. Alonso-Coello P, Oxman AD, Moberg J, Brignardello-Petersen R, Akl EA, Davoli M, et al. 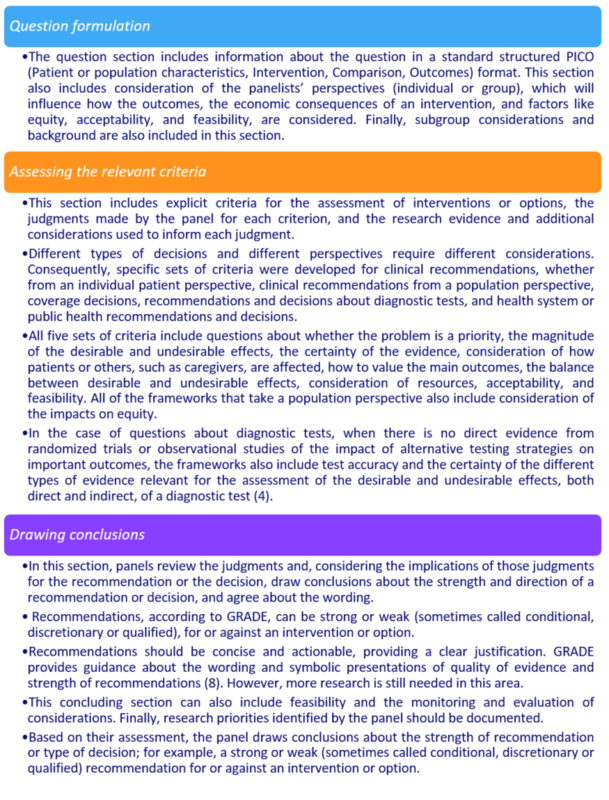 GRADE Evidence to Decision (EtD) frameworks: a systematic and transparent approach to making well informed healthcare choices. 2: Clinical practice guidelines. BMJ. 2016;353:i2089. Guyatt GH, Oxman AD, Kunz R, Falck-Ytter Y, Vist GE, et al: GRADE Working Group. Going from evidence to recommendations. BMJ 2008; 336:1049-51. Andrews J, Guyatt GH, Oxman AD, Alderson P, Dahm P, et al. GRADE guidelines: 14. Going from evidence to recommendations: the significance and presentation of recommendations. J Clin Epidemiol 2013 Jan 9. pii: S0895-4356(12)00138-2. doi: 10.1016/j.jclinepi.2012.03.013. Andrews J, Schünemann HJ, Oxman AD, Kunz R, Brozek J, et al. GRADE guidelines: 15. Going from evidence to recommendations: determinants of a recommendations direction and strength. J Clin Epidemiol 2013 Apr 6. pii: S0895-4356(13)00054-1. doi: 10.1016/j.jclinepi.2013.02.003. Pablo Alonso-Coello is a researcher at the Iberoamerican Cochrane Center (Biomedical Research Institute Sant Pau), in Barcelona. 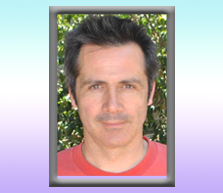 He is a member of the GRADE Guidance Group and is responsible of the Barcelona GRADE center. He is also the Director of the Scientific Committee of GuiaSalud, the organization in charge of coordinating the Spanish National Health System Program of Clinical Guidelines.